The Clarke Museum has an exhibit featuring the Eureka Theater. This historic landmark will host a jubilee on February 28th through March 2nd to celebrate the Theater's 75th anniversary. Please visit http://www.theeurekatheater.org/ for more information. 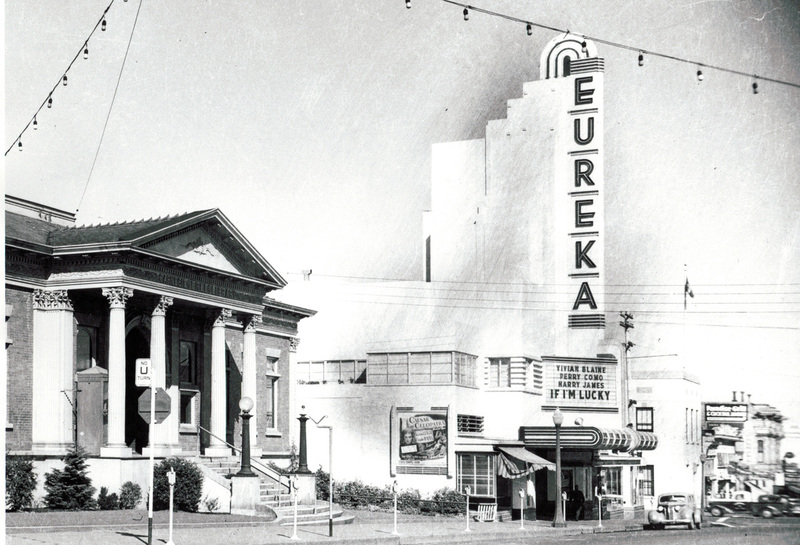 The City of Eureka’s theater history—opera houses, storefront theaters, and dual-purpose theaters for vaudeville and films—continued in 1939 with the construction of the Eureka Theater, Humboldt County's ultra-modern, neon-brilliant movie theater. Built for George M. Mann, the Eureka Theater represents this popular and very modern design constructed as the Depression began to ease and prior to World War II. Although Humboldt County was a last frontier for Euro-American settlement, beginning in the spring of 1850, entertainment and formal venues for music and performances were early amenities. Opera houses, pavilions, and halls were constructed for both local and imported entertainment and with the completion of the Ingomar Theater in December 1892, a new era of first-class theaters and quality theatrical performances from San Francisco was initiated. Vaudeville, comedy, comic opera, and minstrel shows were among the local fare, along with serious theater productions. The first “moving pictures” in Eureka were shown at the Ingomar in 1899. For the next several years, local halls showed what were described as moving pictures, but these were bonus features associated with live performances which continued to be the primary drawing card to local theaters well into the 20th century. Storefront conversions into theaters for both live performances and moving pictures was the norm. The first exception was the Rialto Theatre, constructed in 1918, which was specifically built as a theater for live stage productions and moving pictures. The State Theatre, constructed in 1920, showed moving pictures and, in fact, was the first place Eurekans experienced the “talkies” in 1929, but in early years, imported vaudeville, local performances, and community events were equally important. The Rialto and the State were dual-purpose theaters, not movie theaters; Eurekans had to wait another twenty years for that kind of theater. Hard on the heels of the Depression, theatre magnate George M. Mann, who owned and built theaters from Dinuba, California to Klamath Falls, Oregon, correctly anticipated that Humboldt County was eager for new entertainment opportunities. His shrewd business sense served him well, and he constructed successful theaters in Eureka’s neighboring towns of Fortuna and Arcata in 1938 and the following year, the Eureka Theater. All three theaters were designed by the brilliant West Coast architect William B. David, who at one point had worked in the MGM Art Department, helping to design some of the classic Hollywood sets of the 1930s, before re-focusing his efforts on architectural design. David's design for the Eureka Theater, with its streamline Art Moderne architecture, brilliantly lighted by red, blue and gold neon, was new and innovative, the kind of glitz that a Depression-weary public appreciated. The movies were recent releases, providing Eureka citizens with the same entertainment enjoyed by urban patrons in San Francisco. Built as a modern, state-of-the-art movie theater, the Eureka Theater was the culmination of the community’s theater history of opera houses, converted storefronts, and dual-purpose stage and film theaters. The Eureka Theater marked Eureka’s entry into the world of movie theaters and its Art Moderne architecture, preserved with great integrity and artistry, conveys that significance. The Humboldt Standard’s announcement in 1937, “Magnificent New Structure to House Hotel and Theatre: Redwood Theatres, Inc. to Erect Palatial New Building at Sixth and F” heralded construction of Eureka’s first new theater in almost two decades and was seen as a major component in the “general wave of prosperity” that was sweeping through Eureka during the late 1930s. The construction of a modern theater building fit into the campaign waged by the local press and business leaders to modernize Eureka, to shake off the effects of the Depression, and invest in a prosperous future. Bids were solicited for construction of the Eureka Theater and business block in March 1938. In this announcement, the new play house was described as “modern,” “best adapted to the entertainment world,” and equipped with “ultra-modern fixtures and equipment.” The original plans for the property at 6th and F streets included a five-story hotel with 162 rooms, private baths, modern elevators, bar and fiesta room for dancing and entertainment, banquet room, coffee shop, and more so that guests would receive the best in food and service. However, at some point between that announcement and the call for bids nine months later, the hotel was dropped and the focus was on the theater and the business block. Construction of the new theater began in the summer of 1938 under the direction of Moore & Roberts, a San Francisco contractor employed by Mann to build other theaters, utilizing modern design, building practices and materials. As construction neared the end point with interior finishing and installation of equipment in high gear, the local press reported, “Eureka is assured the most modern theater in the state in every detail.” As opening night drew near, the Standard reported on the progress of final details – installing the heating and ventilating systems, drying the plaster, painting and decorating, hanging the lighting fixtures, laying 700 yards of carpeting, adding the mirrors and furnishings in restroom lounges, tiling the outer lobby, installing the projectors and equipment, and very importantly, erecting the 21-by-28-foot Walker White sound screen. The Eureka Theater was a beautiful, ultra-modern movie theater when constructed in 1939 and was an expression of optimism and confidence in Eureka and Humboldt County as they pulled out of the Depression. For over fifty years, in times of war and peace, good times and hard times, the Eureka provided the citizens of Humboldt County with countless hours of entertainment. The theater was converted to a triplex (with the balcony being split into two separate theatres) in 1978. The Eureka Theater ceased showing regularly scheduled movies in 1996, due to the building of new multiplex theaters in the Eureka area. After forming volunteer commitees and a board of directors, the Eureka has reopened for the community to use. It now provides a range of performance venues, from classic movies and live entertainment, to group meetings, fundraisers and other community events. -- In part from National Register of Historic Places, Eureka Theatre, Eureka, Humboldt County, California, National Register #09001199.